Sure, there may be some serious issues in play here, but this movie is basically fluff, starring three of our favorite older movie stars. And that isn’t all bad. 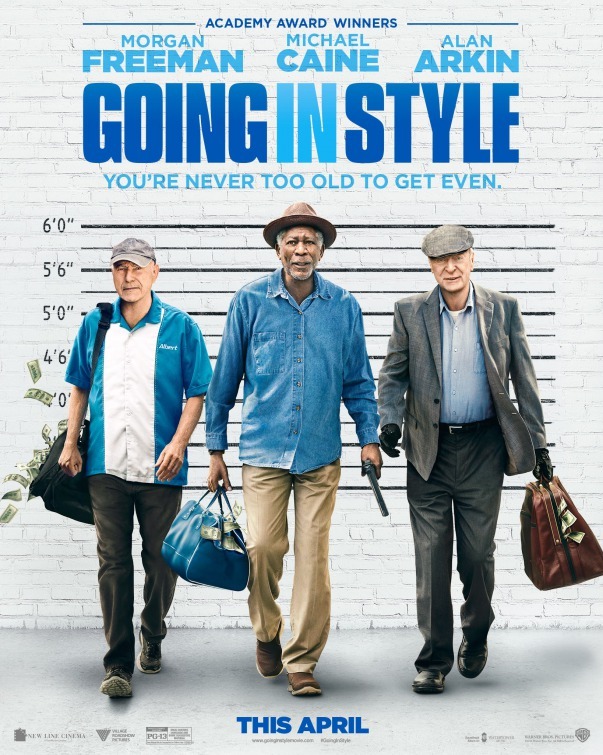 Going in Style stars Morgan Freeman, Michael Caine and Alan Arkin as lifelong friends Willie, Joe and Albert. After thirty years doing factory work, Joe was facing losing his house, while all three were losing their pensions. However, when Joe winds up at the bank when it was being robbed, he gets an idea. Heading to his friends, Joe suggests a bank robbery of their own. Willie, who was in need of a kidney transplant, is the first to join in, but Albert needed more convincing. When he discovered that the bank was taking his pension money to pay other bills, the proverbial straw had broken the proverbial camel’s back. This movie is nothing special. The story stretches credibility and nothing surprising happens. The strength of Going in Style was the three wonderful actors in the lead roles. In is fun to see Freeman, Caine and Arkin interact that you forgive the weaknesses that float around this film. The movie itself is remarkably disposable, and will probably be forgotten fairly quickly. Yet, these are three masters of their craft and they bring enough gravitas to pull the film into the positive category. Add to them a fun role for Ann-Margret as Annie, a friend of Albert who wants more from him, and the cast is certainly a strength. I really enjoyed the cute coupling of Arkin and Margret. The jokes are pretty standard, focusing on jokes about older people, even having Christopher Lloyd playing an almost demented old guy. Matt Dillon was here as a dimwitted FBI agent and our new Tick, Peter Serafinowicz appeared as Joe’s ex-son-in-law. And the heist was pretty hard to believe. The heist included a weird scene between Willie and a little girl that was meant to only set up the final act. There could have been something really special here as the story had some serious situations come up early on. The problem was these problems were cast aside, and the tone of the film was pretty inconsistent. This film could have been a sharper, darker comedy that had something serious to say about the manner in which we treat our elderly people in America and the situation of banks and big business screwing over the little guy. Unfortunately, Going in Style settled for the unremarkable instead of the satirical. And yet, despite these problems, the charm of Freeman, Arkin and Caine really shone through and helped make Going in Style more than it should have been. It is no where near as strong of a film as it could have been, but still, behind the star power of its lead roles, this film turns out to be a fun time.